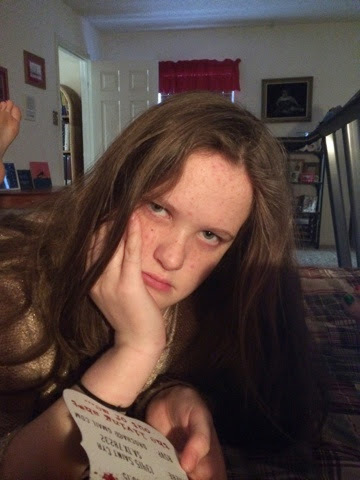 Today my youngest daughter officially became an insufferable teenager. I know this to be true because I've previously experienced the horror of watching two perfectly delightful children morph rapidly into that beastly, ghastly creature known as The Teenager. Me: "Get off your phone." Me: "Because I asked you to." Teenager: "That's not a reason at all." Me: "Clean your room, (or take a shower, or pick up your clothes, or do your homework....)"
I used to think that the hardest part of child-rearing was from birth to 3. The sheer physical demands of sleep deprivation combined with the new and overwhelming responsibility of keeping a fragile newborn alive nearly did me in. Where was the training for this!? And it didn't get easier with the second, or the third. Oh no, I was older but I had less stamina and I was even more tired if that's possible. Me, 2 minutes after we sit down to dinner: "I should call and see how the babysitter is doing." But things changed around age 3 when my oldest child looked into my eyes and we had our first real conversation. I conversed, intelligently, in a non-baby sing-song voice with a human being that I had created, nurtured, loved and put all my time and energy into for 3 years. Despite the exhaustion, I was actually head over heels in love and would never have thought that I could be any more enamored with my child than I already was, but that first real conversation was one of the best moments in my life. For several years after that I swear I could see her brain developing right in front of my eyes. As a new mom I read all the research that says the most brain growth activity is from birth to 3, so I fed my little growing babies lots of input and they took it all in. It's a good thing babies are so cute. They smile at you, and coo, and snuggle, and you melt with love, which is what keeps you from putting a pillow over your head at 2:30 am when they wake up for the 3rd time that night. And yes, you take pride in their growth and appreciate their healthy development, but for me that all paled in comparison to the little person my child became around 3. It only got better from there. For all three of my girls, elementary school was awesome. Language, art, storytelling, music - they explored, expanded and I got to watch it all. School plays and spelling bees, times tables and book reports. And let's not forget those Thanksgiving turkey hand-prints of love. All of their teachers loved them, reporting what a joy they were to teach. So smart! So funny! So helpful and cooperative! ** What a proud mommy I was! And then, again, boom! Sometime in middle school, without warning, it's over. The adolescent transition from sweet to sour is bitter indeed. One minute you're sitting together on the living room floor playing with the cat and laughing about nothing and the next minute she's slamming her bedroom door and telling you that "in case you hadn't noticed," she's "not a kid anymore," and you "just don't understand her." So having passed through all the ages and stages of the developing female child twice before now, I can honestly say that the hardest one to mother through is the teenage years. The hell of sleepless nights with an infant is nothing compared to the agony of a missed curfew. Learning to live with using the bathroom while a toddler clings to your ankles is unfortunate, but witnessing your daughter's pure adoration morph into withering contempt is utterly heartbreaking. I'm pretty sure that residual affection left over from the cute baby stage is the only thing that has compelled me to keep mothering the monsters they become as teenagers. That may sound harsh, but trust me, withering contempt is no picnic. There's only one thing to do now, and that is to hope for grandchildren one day so that I can return to that cute baby stage and conversing with intelligent 3 year olds with none of the unpleasant strings attached. They say that's the ultimate payback. Bring it on!